He is Rev. Fred Phelps, a 72-year-old father of 13 children, disbarred lawyer, convicted criminal and pastor of the 100-member Topeka (Kansas USA) based Westboro Baptist Church. A reporter once described him as, "a week-old corpse dressed for a night out". He is most notorious, though, for his picketing activities. He first came to attention when he picketed the funeral of Matthew Shepard, the 21 year old gay man who was pistol-whipped, tied to a fencepost in Wyoming and left to die. He was not picketing about the brutality and homophobia of Matthew's murder, instead Phelps and his supporters were holding placards that read "God Hates Fags" and "Matthew Now Burning In Hell". This was just the tip of the iceberg for Phelps' homophobia and sheer crassness. Phelps commenting on September 11, said that terrorist attacks were God's "wrath and vengeance" against an evil country. "This nation is filthy because it accepts the gay lifestyle," he said. He even blamed this as the cause of the recent space shuttle Columbia disaster. Phelps has described gay men and lesbians as in the same class as other "beasts" like "dogs who eat their own vomit." But his bile is not just reserved for gay men and lesbians, though he does reserve a lot of it for us. He also hates Jews, Catholics, liberals, lawyers and basically anyone who opposes him or he dislikes. When Mother Teresa died, he issued a press release announcing "Mother Teresa in Hell." His main activity seems to be his hate-fuelled picketing. He often pickets funerals of those who have died of Aids, or else he pickets business with pro-gay stances and legislative bodies who are passing equal rights laws. He picketed a local restaurant just because it employed a lesbian. He and his handful of followers, mostly his children and grandchildren, carry placards with slogans such as "Thank God for Aids", "AIDS Cures Fags" and "2 Gay Rights: Aids & Hell." They are not silent either; their chanting containing obscenities that make their placards look tame. There are people who are not taking this obscene prejudice lying down. In 1999 Phelps' website was hacked and anyone who went there was re-directed to another website called GodLovesFags.com. A site that is the opposite of Phelps' bile. When Phelps has picketed Laramie, the Wyoming town were Matthew Shepard lived before he died, he was faced with "Angel Action", a group of people dressed as angels with enormous wings which blocked views of Phelps and his placards. At other pickets Phelps and family have been greeted by larger, counter protests. He is even marginalised by the Christian Right in America. "Most anti-Gay Christians don't even want to be lumped in with this guy," said Mike Webb presenter on GAYBC Radio Network.� "His 'God Hates Fags' and 'AIDS Cures Fags' picket signs are enough to make you heave." 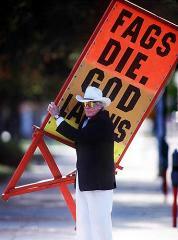 So why need we worry about Fred Phelps? Surely he is just another American lunatic who uses the First Amendment, of the constitution, to justify his type of hatred. He is away from us, on the other side of the Atlantic. Maybe, but not for long. Moises Kaufman, of the New York based Tectonic Theatre Project, was so moved by Matthew Shepard�s death, four years ago, that he and a group of his actors went to Laramie, Wyoming. From this came the play The Laramie Project. It has since been performed in New York, around America and even turned into a film for the HBO television channel, winning awards as it went. The Laramie Project is now set for a London run (the Cochrane Theatre, from March 11th to April 6th). Phelps has a seemingly pathological hatred of Matthew Shepard - a young man he never met. Phelps has picketed memorials to Matthew Shepard and performances of The Laramie Project. Now it is coming to London Phelps says he is coming too, to picket the play. Phelps' brand of hate makes our homegrown rightwing Christians seem like walk in the park. In the 21st Century, as we slowly and finally win equal rights as gay men and lesbians, it is still very chilling to be faced by Phelps with his very old fashioned style of lies, bigotry and ugly prejudice. Let us hope that he is an endangered species.